2014 Moab Skinny Tire Event!!! Eleven years ago Mark Griffith started the Skinny Tire Event to help deal with his grief from losing his older brother to cancer. The first year the event only had a handful of riders mostly friends and family but raised $1,200. The event started to gain steam, and from there on out growing bigger every year. Now over 6,000 riders have participated and have donated over $2 million dollars to a variety of charities supporting cancer research and survivorship. The comradery between cyclists, nature and donating to a very worthy cause make this event unforgettable year after year. Cancer touches so many people negatively its nice to turn some into a positive. Since Skinny Tire’s inception, Sheri Griffith Expeditions has always been a strong supporter, donating equipment and volunteering time. In recent years, this event has become very personal to us as our own co-owner Arlo Tejada has been battling cancer for that past three years. We know and have seen how this event has personally helped cancer survivors; people fighting cancer and people who have lost loved ones. 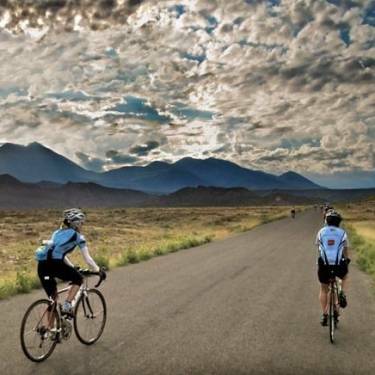 Skinny Tire Events and the Moab Century TourThis weekend is the Moab Century Tour in beautiful Moab, Utah. Mark Griffith and Beth Logan work ha...the Last Cancer update or second to last updateI am still not out of the woods. The doc gave me 50/50chance of relapsing. The bone marrow folks sti...What is this a Life Rollercoaster I am on? Wow, what a crazy Week!